Dyson has long been at the forefront of the more stylish end of the market for vacuum cleaners, fans, humidifiers and beyond. Now it's moving into lighting with the CSYS range of LED task, clamp and standing lamps that have bulbs which "last for 37 years". That's because they employ heat pipe technology to keep them cool. The general idea is that all LED bulbs last for decades, but Dyson is of the opinion that they actually won't, because they don't protect their phosphorus outer coatings from heat, which causes degradation of light and colour (the light starts going a pink colour) and, ultimately, death. To combat this, the CSYS range uses "heat pipe" technology "normally used in satellites" to remove and dissipate excess heat via the lamps' horizontal arms. Heat pipes are metal vacuum tubes with a very small amount of liquid in. The liquid comes into contact with a heat source at one end of the pipe - in this case, the LED bulb - and almost instantly turns to steam, heads to the other end, evaporates and voila: you have cooling. The premium-priced cleverness does not end there; the CSYS range, in typical Dyson fashion, involves a LOT of design. As well as the heat-reduced, longer-lasting bulbs, the clamp arrangement is also unique. Where most task lamps rely on tension to hold the arm in your desired position, the CSYS's "three-axis glide motion" involves an arm moving vertically using a counterweight pulley system, "inspired by the construction crane". It also extends up to 27.5cm horizontally, along antifriction bearings, while the weighted, zinc alloy base "rotates smoothly through 360 degrees." It looks very attractive, anyway. This, though, is the real killer feature for us: the dimmer has a memory, so when you switch the CSYS on, the light is at the same dimmer setting as you left it at last time. The lack of such a feature has been irritating us massively every time we've used a smart bulb in recent times. 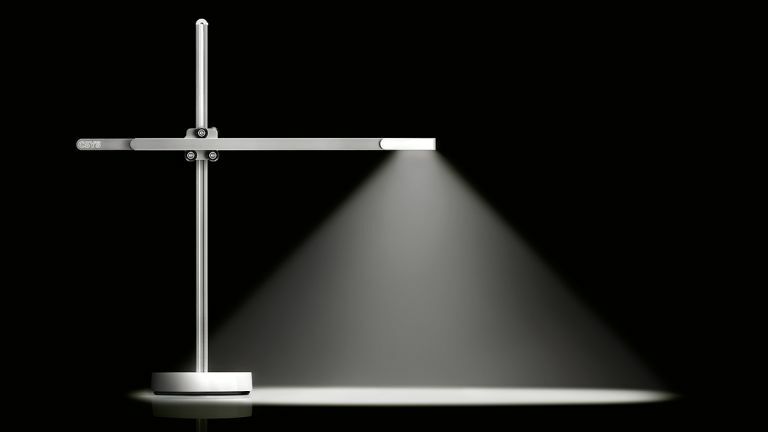 The CSYS lights are the work of Son of Sir James, Jake Dyson. He came from Gloucs and had a thirst for knwoledge, so studied product design at (Central) St Martins College (of Art and Design). Dyson Jr's been working on lighting products since 2004 and the CSYS has been in gestation for at least the last three. The range is available now and includes task and clamp lamps for your desk at £399, as well as the floorstanding CSYS Tall at £599.